As kitchen wisdom goes, I often think the best tricks are the simplest. One-pan cooking, for example. The ability to cook an entire meal on a single rimmed sheet pan—an act that leaves you with nothing but that one pan to clean when dinner’s over—to me is nothing short of magic. And the secret to making it work really is just a matter of organizing the order in which each ingredient lands on the baking sheet to ensure each gets neither too little nor too much time in the oven. 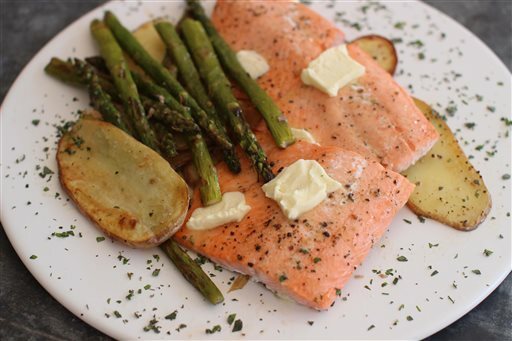 And this recipe for baked steelhead trout with asparagus and potatoes will show you just how easy that is. We start by seasoning all the parts individually at the beginning of the cooking process, not the end. If you wait until the end, the salt won’t do its job, which isn’t only to contribute saltiness, but to enhance the flavour of the ingredient to which it’s added. In practice, salt doesn’t so much amplify flavour as tamp down bitterness, thus allowing a food’s other flavours—notably its sweetness or sourness—to shine. First in the oven is the asparagus so that it can be properly cooked and lightly browned all by itself and without crowding. Any time you want to brown a vegetable in the oven, you must make sure to spread it out across the pan in a single layer. Then the asparagus takes a break and the potatoes go in. Finally the fish comes into play. Lay it right on top of the now-browned potatoes and bake it until tender on the oven’s middle shelf. How do you know when the fish is done? When a knife slides in with little resistance, the fish is good to go. Butter and herbs are this recipe’s crowning touch. The hot fish melts the butter, creating a kind of instant sauce. Simple, right? Delicious, too. And just one pan to clean up. Now that’s my kind of meal. Heat the oven to 230º C (450º F). Line a rimmed baking sheet with foil. On the prepared baking sheet, toss the asparagus with 10 ml (2 tsp) of the oil and a generous pinch each of salt and pepper. Spread the asparagus in an even layer. Bake on the oven’s top rack until starting to brown and are crisp-tender, about 7 minutes for thicker asparagus, 3 minutes for thin asparagus. Transfer to a plate and set aside. On the baking sheet, toss the potatoes with another 10 ml (2 tsp) of the oil and a generous pinch each of salt and pepper. Spread the potatoes in an even layer. Bake on the oven’s top rack until barely golden, 8 to 10 minutes. Remove the pan from the oven and reduce the temperature to 200º C (400º F). Arrange the fish pieces in one layer on top of the potatoes, sprinkle them with the lemon juice, drizzle with the remaining 10 ml (2 tsp) of oil, then season with salt and pepper. Set the pan on the oven’s middle shelf and bake for 5 minutes. Add the asparagus to the sheet pan and bake another 2 to 3 minutes, or until the fish is just cooked through. Transfer the fish to 4 serving plates and top each portion with a few slices of butter. Transfer a quarter of the potatoes and asparagus to each of the plates, then sprinkle the herbs over each serving.